Key logging software records each and every activity done on your computer or laptop and tells you via sending screenshots. Stealth keylogger can records all internet passwords, chats, emails, IMs, web sites, snapshots, programs run, keystrokes typed, etc. Undetectable utility records each activity in a password protected log file that is invisible to everyone. You can detect where your spouse or kids engaged from your PC in your absence. 3ami MAS is for personal, SME, corporate and government users who need a simple and effective tool for monitoring employee productivity or activity for compliance with legal requirements. View a summary for each monitored computer (or user) of all activity for any specified period and detail of exactly what that activity consisted of, down to the last key pressed, complete emails and attachments plus video playback of screens viewed by the user. 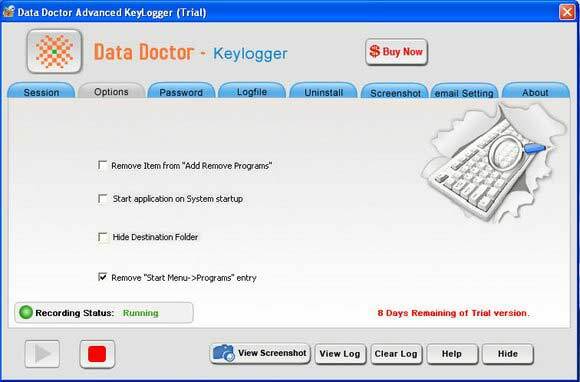 All In One Keylogger implements the state-of-art technology, and guarantees you full control over your computer. Have you ever thought what site your children are surfing when you are not at home? Who the "girlfriend" your wife is chatting with all the time really is? What your employees are doing when you are not at home? Now you can monitor chats,e-mails,keystrokes typed,desktop activities, microphone...It can even send you logs by email/FTP.